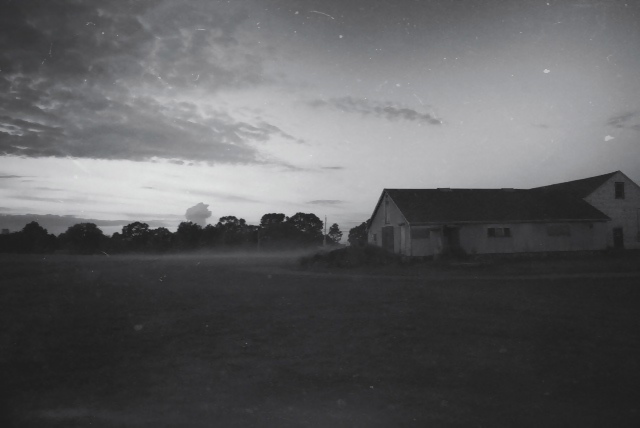 At sunset, the surface of the farm is coated with fog and I am in the midst of my own inner fog—a migraine that trickled through the upper quadrant of my head at sunrise. By noon, as the sky cracked with rain, I could no longer stand the relentless pain. Stripped of capacity to read or write, I closed the bedroom shades and got under the covers. When I later emerged I heard the sound of rain hurling against the roof, mimicking the interior of my head: a deluge of prickly spasms. But soccer practice goes on, which means my daughter, Lu, will need me to pick her up at 5:30 pm. So at 6:00 pm I am in the car with her, heading home down Abbott Run Valley Road, my head a little less prickly but wildly pounding, when I see this white miasma sweeping across the fields of Franklin Farm—a low-hanging grey haze much like my daylong stupor. Of course, yes, I pull over, stop. But I have only my phone. I take two (blurry) pictures and Lu yells at me to get back in the car. It’s cold, she says, and she needs to get to her schoolwork. I bring her home, grab my camera and return to the farm, running across swells of green like a madwoman, hand gripping camera, arms thrashing in the air, trying to capture the now escaping haze. Literally—everything seems literal these days—it’s flying the coop! (The empty coop, that is.) I chase it. It’s beautiful, it’s rolling and twisting and the entire farm is so very quiet. Except for the pumpkin-colored leaves mashing underfoot. The fog is one step ahead of me as I run toward it. One step. I push forward, dazed, it pushes out. I am out of breath now, barely at its edge when the entire mass dissipates in the crisp air, and I stop to watch it flee. A moment later, my head clears. Vanishes like the fog. I go home and make chicken soup. This entry was tagged fog, Franklin Farm, migraine, nature, photography. Bookmark the permalink. I hope you feel better soon Jayne! Migraine’s are a sign of high intelligence. Thanks, Megan. Feeling better today! Some ancient Greek sage was quoted as saying, ‘As without, so within’. Perhaps chasing fog is a good panacea for migraine. Glad to hear you are feeling better.